The Innovation Gallery is a living, transformable space—a platform from which Hilton showcases their leadership in hospitality and tells their story of innovation as it redefines the 13 brands within the Hilton portfolio. We were faced with the challenge of creating a space that flexibly supports and seamlessly embeds cutting-edge technology, while also delivering a high-end space that sets a new standard for hospitality interiors. A fully-realized embodiment of the future of Hilton’s world-class hotel products, the Gallery balances buzz-worthy experiences with strategic thinking, inviting owners, operators, and partners to join in the innovation conversation. 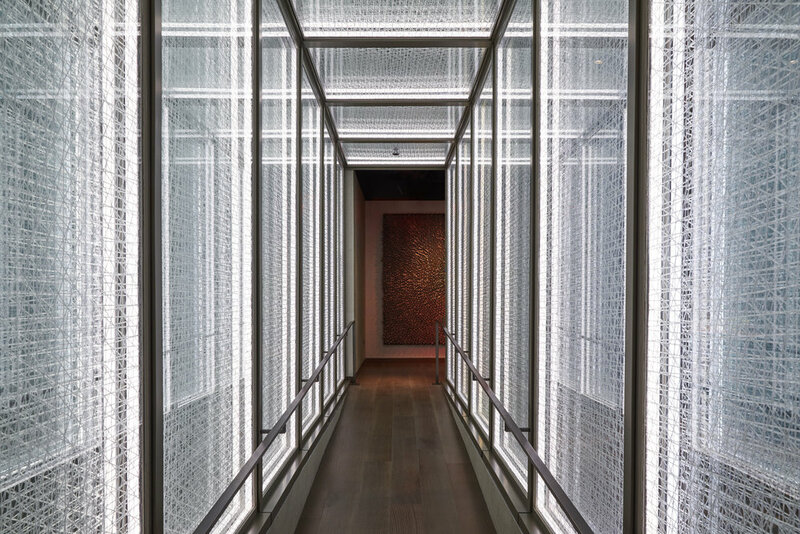 Six interconnected adaptable spaces within the gallery can be programmed individually or linked together as part of a choreographed experience, leveraging both technology and modular design elements to respond to guests’ needs. Display canvases in every area fill the space with content while also disappearing when not needed; some behind wood veneer or mirrored glass, others tucking into the ceiling or fading into architectural finishes. A custom-built Virtual Reality system reinvents the experience of touring design concepts, turning an elevated wing of the space into an immersive model room with full-scale floor plans and responsive information overlays. The Innovation Gallery is a place that rewards exploration and is a stage for brand stories, embodying the best physical and sensorial aspects of great hospitality.